Brassolis sophorae vulpeculus from the Nymphalidae family is a close member to the Caligo genus (the "Owl Butterfly") but smaller and less colorfull. This butterfly was photographed after it emerged from its pupa so it was very easy and calm (perfect condition for photographing). The hosts of this specie are Palm trees and many larvae were seen and photographed in the area walking on the ground looking for somewhere to climb and puptae upon. 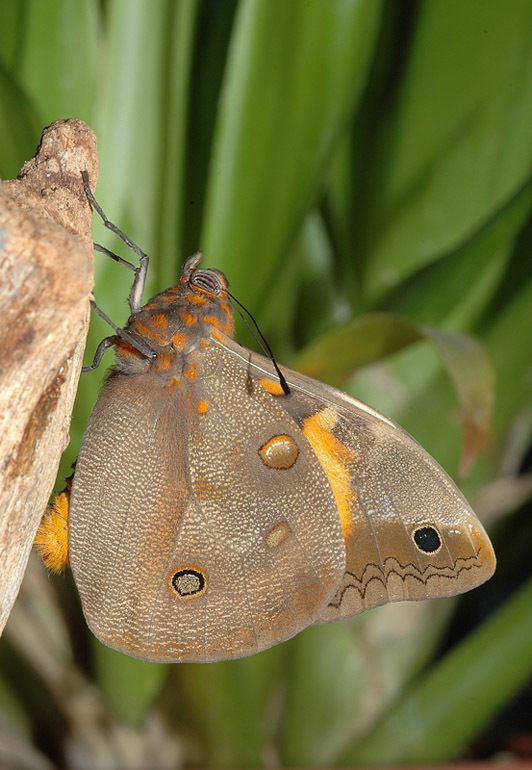 it is not a day flying specie, the adults are seen only at dusk like their relative Caligo. a wonderful picture of this immaculate owl butterfly. Absolutely perfect sharpness and optimal point of view to show the beauty of this butterfly. I like the pleasant natural colours. Beautiful capture, Oz. It's a wonderful subject and well recorded. A prefect composition here, with it nice and stragith. The flash fill helped, too. A couple minor suggestions. First, I think you could use a little mroe blur in the bg -- shooting at f/11 should suffice. Second, you might try playing with toning down the flash fill (I like the "Flash level" to "-1.0. This allows more aof a balance between natural and artifical light, it also tends to reduce the range of the flash). This is a wonderful shot as it is, though. Lovely macro.Excellent capture and very good POV ,Your image is sharp whit excellent details.Colors and light are also very nice. Wonderful butterfly with magnicifent colors! Excellent POV, sharpness and composition. Another butterfly that i didn't know. Excellent sharpness and great colors.